As I'm sure many of you are aware, I'm LDS. Up until recently I was working with the beautiful 14-16 year old girls of my ward (congregation) in the Young Women program. I was so sad to say good-bye to teaching them, but at the same time was excited about the new calling (service assignment) that I was given over a group of 10 year olds in Primary. It has been so much fun teaching these young children already. But I do miss my Young Women. I miss their smiles, the way they made me feel so important, and the things they taught me. 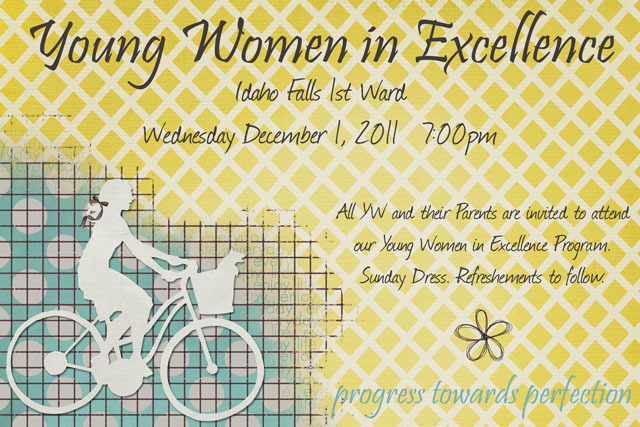 One of my favorite parts about Young Womens is the Personal Progress program. The girls set goals based on specific values and are challenged in such a wonderful way. They learn and grow and blossom. I wish I could convince them of their beauty, of their amazing talent and their divine nature, but I can not, and so they must learn it for themselves. Each year these girls are challenged to come up with their own unique project and to prepare to share it in a special evening called Young Women in Excellence. They prepare and share amazing things about themselves and we learn from them. I love that night - the girls receive recognition for amazing accomplishments. It's something that they need so desperately at their age. Recently as I considered the Personal Progress program and my accomplishments in it as a Young Woman, I came to realize that I have continued to use those things I was taught in that program in my life today. I continue to set lofty goals for myself, I continue to develop my talents (and I use this blog as the way to challenge myself in that aspect), I continue to progress spiritually, and most of all, I continue to walk in Faith, trusting in the Lord, knowing that I am His daughter and that He truly does have a divine plan for me.